Candles are a huge part of my self care. Honestly, when I start feeling depressed or over-anxious, I light a candle and feel a little better. I’m not saying to head to Yankee Candle instead of your therapist, but candles can be surprisingly soothing when things get hard. So, every week I’ll talk about a candle I love and I’ll try to give you some deep cuts from the fragrant wax world. Like, I’ll go way beyond Bed, Bath & Beyond. And all my recommendations will cost $40 or less (usually a lot less), unless my life is truly changed by a costlier candle. All I've ever wanted is a home that smells like a mix of Christmas spices and vanilla. Enter: this magical candle. The scent is strong enough to cover your apartment in a warm glow of baked goods, yet subtle and natural enough that you aren’t choking on fake vanilla. This candle slowly seeps into your room, filling every corner with a touch of spice and sweetness. It may not remind me of my grandma, but it’s seems to be an amalgam of all great grandmas of history. As the candle flickers, for a moment, I feel like I live in a beautiful country home that would make Martha Stewart and Ina Garten green with envy. There’s a loaf of bread, an apple pie, and hearty dinner cooking in the oven, while I pad around my chef’s kitchen in my immaculate shabby chic (emphasis on chic) abode. But then the candle fades and I remember that I actually live in a one bedroom apartment in East Hollywood, where a windowless white van masquerading as an ice cream trucks continuously plays an off-key version of “It’s A Small World” right outside my window. But hey -- at least it smells really good inside! 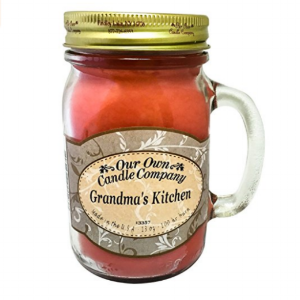 On a scale of “Candle in the Wind” (based on a tragedy) to “Candle on the Water” (the ultimate expression of love), this Grandma’s Kitchen firmly stands at the peak of “Candle on the Water” goodness. Disclosure: This post contains affiliate and referral links.